The Berkeley Lower Extremity Exoskeleton (BLEEX), a DARPA robotics engineering project that is designed to help foot soldiers carry more supplies for longer distances, was demonstrated in California earlier this week. The user straps the exoskeleton legs onto his own, and puts on a backpack with an engine, control system and space for materiel. The robotic device could also assist other professionals, like firemen carrying heavy equipment. The user of this device controls it purely with body movements. When the user moves his legs, the exoskeleton provides additional power in concert with the natural movement. "The real genius in the design is that you don't have to control the suit; you just wear it, like your clothes, like skin." For a more stylish, urban gear version, see the polycarbon exo from William Gibson's 1988 novel Mona Lisa Overdrive. 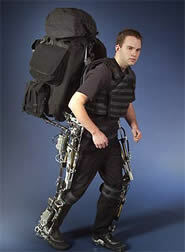 See Robotic Artificial Exoskeleton Takes the Strain and DARPATech 2004 for more information.